The Air Jordan 4 Retro “Classic Green” released on July 24th, 2004 at select Jordan Brand retailers and the retail price tag was set at $100 USD. This classic Air Jordan 4 was dressed in a White, Chrome, and Classic Green color scheme. The shoe featured an all-White leather upper with Classic Green accents on the lacing tabs, tongue, and air bubble on the heel of the shoe. Finishing off the look is a Chrome colored Jumpman logo on the back heel. 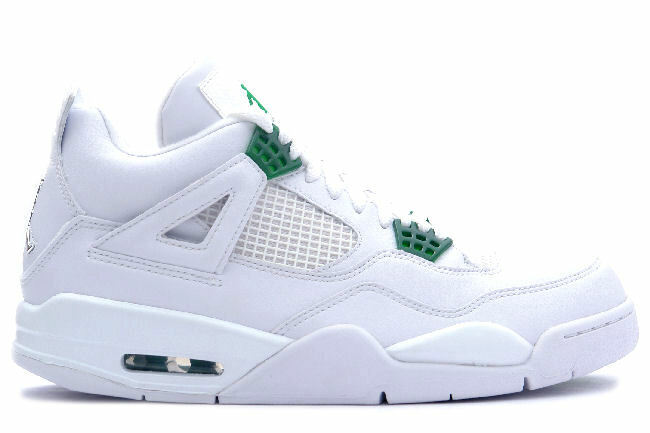 During the Summer of 2004, the Air Jordan 4 “Classic Green” was a hot release with its all-White base and only minor hint of Green. But even as hot as it was, the shoe still remains a release that not a lot of people think of when thinking of the classic Air Jordan 4 silhouette. Let us know what you guys think of them in the comment section. Where do you have them ranked amongst the other Retro 4 releases? Lastly, would you like to see Jordan Brand release a remastered version of them? Next articleCommunity Poll: Should Jordan Brand Release Another Air Jordan Retro “Candy Pack”?